It's important to get the facts about soccer cleats before you go shopping in order to get the most for your money. The upper portion of a soccer cleat is made from either leather or synthetic leather. Genuine leather is typically used on higher-quality cleats. Real leather is softer and more flexible than synthetic. Genuine leather also allows the player to feel the ball better and it provides excellent breathability. In addition, real leather usually yields a better fit. However, real leather cleats are more expensive than those made from synthetic leather. Synthetic leather cleats are less expensive, but they don't offer the same fit and feel as soccer shoes made from real leather. If you are looking to purchase toddler soccer cleats, then consider buying synthetic. However, intermediate and advanced players will benefit more from soccer cleats made from genuine leather. The large studs on the bottom of soccer shoes are referred to as "cleats." These studs help soccer players grip the playing surface better. In addition, they further assist to get the player into his desired position without falling. Cleats also aid players who move quickly in short periods of time. The studs or "cleats" are typically made of hard plastic or a rubber-plastic mix. Metal-tipped cleats are banned from the sport, as they can cause serious injuries. The plastic versions feature rounded edges, but still offer excellent grip on grassy playing fields. Advanced soccer players usually purchase shoes that feature replaceable cleats. In doing so they can extend the life of the shoe by removing and replacing dull or damaged cleats as needed. Regardless of whether you are a beginner or advanced soccer player, having proper fitting soccer cleats is critical to success on the field. 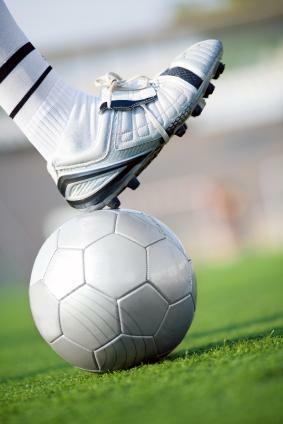 Soccer cleats are made by a number of different manufacturers that offer varying sizes. Since there is little uniformity among soccer cleat manufacturers, it is which important to try on and move around in soccer shoes prior to purchasing them to ensure a good fit. You should also be mindful of the cut of a particular soccer cleat. When shopping for youth soccer cleats, look for a higher cut. This will provide your child with additional support and reduce the risk of the chances of injury to the ankle and foot. For advanced players, who are looking for greater ease of movement, it is better to purchase a low-cut soccer shoe. When trying on soccer cleats remember to bring along the same type of socks you will be wearing on game day. This will help determine a good fit in the heel and toe area. Keep in mind that ill-fitting cleats can cause blisters, or worse, damage a player's ligaments, knees and ankles.